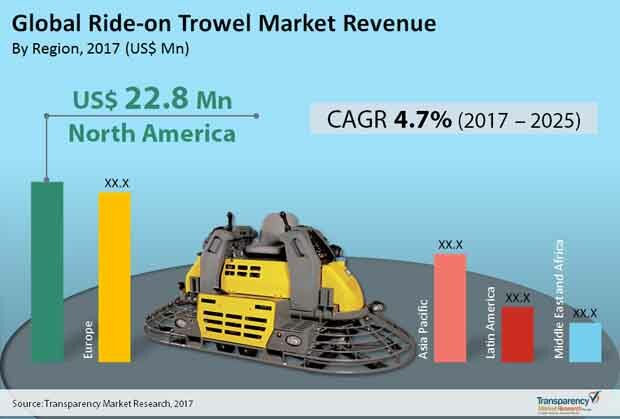 Some of the prominent players operating in the ride-on trowel market are Allen Engineering, Bartell Machinery Systems, Atlas Copco, Shanghai Dragon Construction Equipment Co., Ltd., Multiquip-Whiteman, Masterpac, MBW Inc., Ltd., Parchem Construction Supplies Pty. Ltd., Shanghai Dynamic Construction Machinery Co. Ltd. and Wacker Neuson, finds Transparency Market Research (TMR). Several of these players are offering a wide product portfolio featuring user-friendly, ergonomic control systems for various applications and are focused on strengthening their sales strategies, in order to consolidate their shares in various regions, notes TMR. A number of emerging and leading players are investing in product innovations. They are developing robust technologies featuring a combination of size and power to enable more time-efficient operation, in a move to stay ahead of others, observes the market research firm. As a result, the overall market is fairly competitive. Witnessing ample opportunities in the construction industry in several developed and developing regions and continued expansion of infrastructural developments worldwide, the global ride-on trowel market is prognosticated to rise at a CAGR of 4.7% from 2017 to 2025, according to TMR. The market stood at US$67.0 Mn in 2016 and is predicted to reach a valuation of US$101.0 Mn by the end of 2025. Based on type of fuel used, ride-on trowels are powered by petrol, diesel, and electric. Of these, petrol-based ride-on trowel held the leading market share in 2016 and is projected to dominate throughout the forecast period. The demand for these will primarily be driven by a burgeoning construction industry in various parts of the world, especially in emerging countries. Regionally, currently North America leads the global market, vis-à-vis revenue, and is expected to retain its dominance throughout the assessment period. The need for mechanized concrete finishing technology for trowelling concrete surfaces is a key factor boosting the demand for ride-on trowels. The rising demand for flat and smoother concrete surfaces in residential, commercial, and industrial buildings to meet heavy load requirements is a key aspect bolstering the demand for better ride-on trowel technology. A burgeoning construction industry in various developing regions and the rapid pace of infrastructural development in several emerging economies, coupled with the increasing labor cost, are prominent trends stoking the demand for these construction equipment. The presence of heavy loads in airports, garages, and warehouses is a key factor driving the demand for advanced trowelling technologies suitable for high-tolerance concrete floors, thereby boosting the overall ride-on trowel market. The intensifying demand for superior floating and high production finishing jobs in developing and developed nations is a prominent factor that will stimulated technology improvements. A number of emerging players investing in research and development activities bodes well for the market. There is prominent demand for non-overlapping machines among contractors owing to their cost-effectiveness and ability to provide superior floating for high production finishing jobs. This augurs well for the ride-on trowel market. The lack of operator comfort and high maintenance of sophisticated machinery, along with their high cost of operation, are key factors likely to impede the adoption of ride-on trowels among relatively small contractors. Nevertheless, several prominent players are focused on engineering products that allow more convenient operation over extended period of time. The advent of advanced ride-on trowel lines with user friendly controls, easy maneuverability, and optimum operational requirements is a crucial factor opening lucrative avenues for market players. Strict implementation of enforcement of labor laws and expanding infrastructure size are expected to accentuate the demand for power-based trowels. In addition, the launch of product lines that cater to less-intensive production finishing jobs and provides fuel economy and better finishing results is a notable development expected to augur well for the growth of the market over the forecast period.